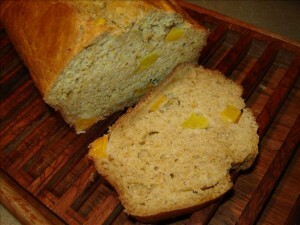 This makes an excellent breakfast bread or a light dinner dessert by adding some vanilla ice-cream. Made some for Kenny this morning, over half is already gone. Cream butter; gradually add sugar, mixing well. Mix together next 6 ingredients; add to creamed mixture alternately with the peaches, beginning and ending with flour mixture. Pour batter into a greased and floured 9 x 5 x 3-inch loaf pan. Bake at 350 degrees for 1 hour or until wooden pick inserted in center comes out clean. Cool in pan 10 minutes. Remove from loaf pan and cool completely.